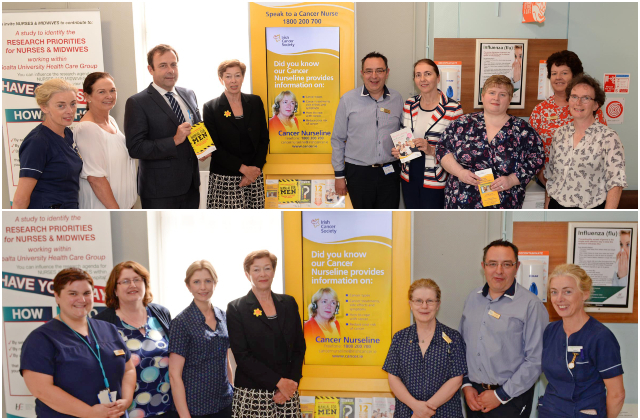 The new Cancer Information Point was officially launched at Portiuncula University Hospital by the Irish Cancer Society and is now open and accessible to the public.The Information Point, located in the front foyer of the hospital, provides cancer information to hospital patients and out-patients as well as visitors and the general public. Speaking at the launch of the Information Point, Joan Kelly, Cancer Support Manager with the Irish Cancer Society said, “We are delighted to officially open the Information Point in Portiuncula hospital. On average, over 1,700 people in Galway receive a cancer diagnosis each year so the Information Point will be a valuable support to local cancer patients, their families and the general public. The Irish Cancer Society is the leading provider of cancer information and support in Ireland. The Society provides cancer information and support to anyone affected by or concerned about cancer. The Cancer Nurseline is open Monday - Friday 9am - 5pm and provides confidential advice, support and information. We also provide information on a range of topics via our information booklets and online resources. To speak to a cancer nurse on any aspect of cancer contact the Cancer Nurseline on Freephone 1800 200 700, email cancernurseline@irishcancer.ie or drop into one of the 13 Daffodil Centres in hospitals nationwide. For locations and opening times email daffodilcentreinfo@irishcancer.ie. For more information visit www.cancer.ie.